It's Day 4 of Release Reviews over at CSS! Today we are showcasing some of the new sentiment sets. I stamped the plaid background stamp in white on Trendsetter Blue cardstock. (Have I mentioned CSS's amazing cardstock selection...click HERE to see all the colors!) 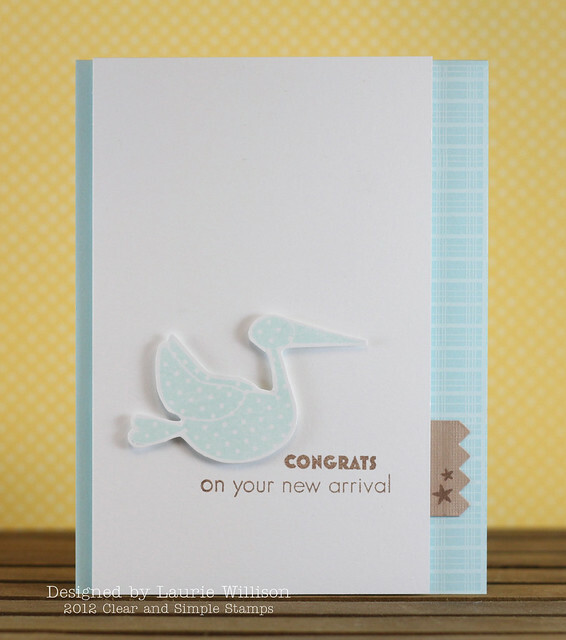 Then I stamped and cut out the stork in Trendsetter blue ink and attached him with foam tape. A quick and easy baby card! OH and the brown tag on the side I made using the pinking die! FUN! Love that thing! it comes as a set with a ric rac die and stamps to match! Go check it out HERE! Here is a list of the DT girls who have creations to share today! Thanks so much for coming by today! Stop back by tomorrow for a great big Clear and Simple party! oh just darling. Love the plaid background in white and the lovely blue color. So cute and graphic. Love it! So sweet! I love those teeny stars on the pinked strip! Such a small detail, but it adds so much. how did you line up that plaid so perfectly on the side, amazing! Quick and easy - totally my style! Though I confess it would have taken me much longer to come up with this! That strip balances your design perfectly! Just perfect, Laurie! I love the design! Such a sweet card Laurie. Just too sweet, and that stork is to die for. Super cute! I love the texture the stamped border on the right side adds to the card! Great design! Love how you used the pinking die as an accent. Love this card and the layout, the little tag of brown is the perfect finishing touch, simply awesome!